FROZEN DIAMONDS™ is an ice-cool slot produced by Rabcat that features some spectacular icons and cascading reels in the backdrop of a starry sky. This 5 reel, 20 fixed payline slot with wild symbols and free spins with 2-3 guaranteed wilds is visually appealing and offers you multiple ways to win. For starters, the traditional reels have been replaced by colourful frozen diamonds that fall from above with every spin. If the symbols make a winning bet line, they detonate – making way for new symbols. This action instantly triggers the Bonus Fall feature which has a positive impact on your wins. After a maximum of two falls, 5 Free Spins are awarded and the third one triggers 10 Free Spins. Unlike the traditional slots where free spins are awarded when three or more scatter symbols land on the reels, the free spins feature in this game results when 3 paylines collapse consecutively three times. This action awards 5 or 10 spins randomly. As you spin the reels, look out for the three-tiered diamond on the left side of the screen. After spinning the reels and there’s a winning combination, the indicator displays the win for the first fall. As new paylines fill up the reels and they form another winning combination. After that, the indicator moves to the second level and does the same if they form the third winning combination. This action triggers 5 or 10 free spins. During the Free Spins feature, the third reel will be randomly loaded with 2 or 3 Wild symbols. That’s not all. If a winning combination is formed during the second Bonus Fall, the Extra Free Spins feature is triggered, and then you get an additional +1 spins with a 2x multiplier. This feature can be retriggered during this feature only. After a winning combination is formed, you can choose to gamble your winnings by picking 1 out of 2 ice cubes and form the correct combination. You have a chance to double your winnings up to 5 times and this feature is available during the base game and right after the free spins feature. Visually, FROZEN DIAMONDS is stunning to look at especially when the symbols fall freely from the above. They are not just pretty to look at because they can offer up to 1,000 times your line bet. The symbols are enclosed in blocks of ice that explode as wining combinations are formed. New symbols replace the blanks and the blasts will continue until there are no more winning combinations left. 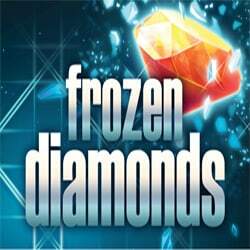 Playing FROZEN DIAMONDS is really good thing even though the Free Spins feature can take some time to get triggered. This bonus feature is sure to have a positive impact on your gaming experience, including the gamble feature whereby you can get to double or quadruple your wins. The fact that you can enjoy on your PC or your mobile device is another advantage. For example, when you join Euro Palace Online Casino you will get $/€500 plus 100 Free Spins to try this slot out. It’s worth your time money!